Is Angela Merkel Motivated By Politics, Selfishness, or Stupidity? Some more excellent thoughts from Mike O’Rourke, the Chief Market Strategist, of BTIG this time on the news of Greek’s bailout. Jean Claude Trichet certainly has a way with words. The European Central Bank President did not pull any punches when expressing his view on the prospects for having IMF involvement in an aid package for Greece. Trichet’s stated, “If the IMF or any other authority exercises any responsibility instead of the Euro group, instead of the governments, this would clearly be very, very bad.” The EU’s political leadership showed what they thought of their top Central Banker’s view. Today kicked off “Merkel Madness,” that time of year when the EU’s political leadership filled out their brackets for the amount of help they want to beg for from the IMF. This “beggar thy neighbour” approach taken by Germany is one in which the haves are manipulating a situation to receive aid from the have-nots. The top 5 IMF members in order of Special Drawing Rights are: the United States 16.7%, Japan 6.2%, Germany 5.9%, France 5% and the U.K. 4.5%. The irony is that the two countries with best fiscal situation (by a pretty fair margin) on that list are Germany and France. It is still hard to comprehend how it is the IMF’s responsibility to ensure that Greece remains a member of the EU. Maybe the United States should lobby the IMF to bail out California. We cannot say whether Merkel’s motivations are politic, selfishness or just stupidity. It is so misguided we are wondering if it is a secret plot to weaken the Euro and boost the EU economies. Of course we are being facetious but that is how absurd the situation is. Greece is not the problem, it can be handled. The problem is that the dysfunctional structure of the EU has been exposed. If a small problem like Greece cannot be solved, imagine if and when a larger problem arises (investing in the U.S. is looking better and better every day). That is the essence of the EU problems – while the IMF can easily step in and handle the situation in Greece, it cannot do so when the next larger problem emerges. It is hard to see how Jean-Claude Trichet does not resign after today. The only problem is that he is the voice of reason and was correct in his assessment. As a result of the antics on the other side of the Atlantic, a nice U.S. equity market rally fuelled by earnings news was stymied. After Trichet’s comments hit the newswires at 1:30 pm, the Euro broke down versus the Dollar, Treasuries caught a bid after two days of selling and the S&P 500 sold off (see charts below). The downside leadership in equities were the Energy and Materials sectors reacting to the Dollar strength. Note: the Head and Shoulders Tops pattern we were looking for in the Energy and Materials sectors are looking very probable. Even if the EU comes up with a responsible plan, the credibility of the leadership has been eradicated, and the market is well aware there is likely much more downside in the Euro and strength in the Dollar. 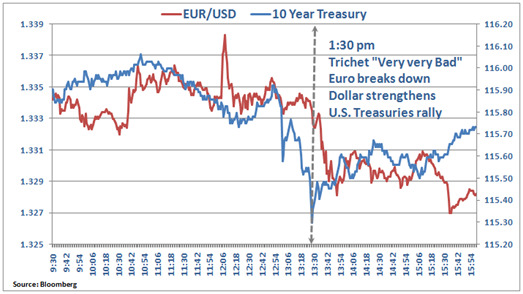 (U.S. Treasury Secretaries over the past decade had it backwards, they should have been advocating a weak Euro instead of a strong Dollar.) Now that it appears that the market has again reached a level where Dollar strength exerts an influence, it will likely provide a modest headwind. Relative to the competition, the Dollar should be strengthening. On a positive note, it should help keep a lid on commodities but it will be up to the earnings and economic recovery to push equities through this headwind.